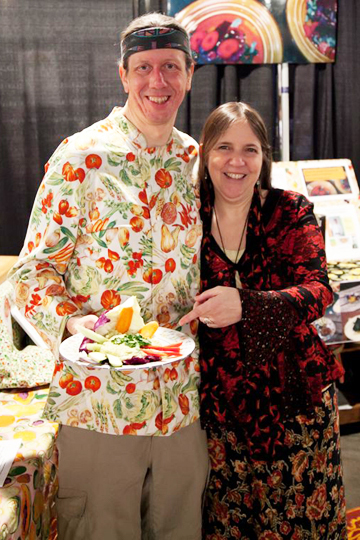 In this fun show we talk with husband and wife team Chef Al Chase and Donna Benjamin, who together, co-founded the Vegan Village at the annual Better Living Show in Portland, Oregon. Chef Al is a graduate of The Culinary Institute of America and has been a chef for over 40 years. Halfway through that time he made the decision to become vegan, and in the 20 years since, he’s been delighting people with extraordinary vegan creations plus teaching others through his vegan culinary arts program. He and Donna are currently working on an e-book of plant-based recipes that could win over even hard-core meat eaters. We also tell you about a surprising new company that is turning food scraps in healthy vegan compost. And we share our want-to-read book list of the latest books by some of our favorite vegan authors. VegNet Bend will hold their monthly meeting and potluck at 6p, May 22, at The Environmental Center, 16 NW Kansas in Bend. Bring a vegan dish to share and your recipe or list of ingredients.